Originally it was written as kids not kid (a goat) but the illustrator thought kid as a goat would be fun…I agree…don’t you? The three R’s—rhythm, rhyme, and repetition—are harvested abundantly in this simple, singsong introduction to farm animals for toddlers. Horses say “nay, nay, nay,” geese “kerplonk” and “honk, honk, honk,” and dogs on the roof go “woof, woof, woof,” presenting a straightforward peek at standard farm residents in their element…. Rhythmically, each four-line “verse” solidly hits its mark, creating a natural, bouncy read-aloud, particularly for preschool groups and one-on-one lap-reading interaction. Accompanying art is appropriately lighthearted and basic…due largely to heavy black outlines that give the…coloring-book quality that suits the text. From sunup to sundown, this buoyant picture book introduces animals on the farm and offers opportunities for children to chime in on the chorus. The text celebrates barnyard life in brief lines studded with rhymes, near rhymes, animal sounds, and the repeated refrain “Down on the farm, /DOWN ON THE FARM.” The large-scale artwork features birds and beasts defined in broad, black outlines in scenes that glow with warm colors. The bold, simplified forms are well suited to a very young audience, particularly in a group setting. Children who look closely at the details will soon notice a little mouse somewhere on each spread as well as plenty of activity, including some comic bits in the illustrations. An amusing romp for young children. PreS-K—“Sun comes up/Kid wakes up! /Down on the farm/Down on the farm.” Kid, a mischievous young goat, begins the day by startling the rooster that crows in alarm. Next, he steals the scarecrow’s boot, while the “Crows peck straw, /Caw, Caw, Caw and the “Horses say, /”Nay, nay, nay.”/Down on the farm, Down on the farm. When Kid jumps into the pond, the ducks and geese quack and honk frantically. Throughout the day, the young goat’s antics elicit raucous responses from all of the other animals, until the sun goes down and, finally, all is quiet. Listeners will delight in following Kid’s adventures. The spirited but simple rhyming text showcases the varied sound of familiar animals, and is perfect for the toddler set. Done in oils and inks the action-packed cartoon artwork is rich, vivid and charming. With its large-format illustrations, repeated refrain, and irresistible farmyard sounds, this book will make a great interactive read-aloud. Employing rhyming verse and kicky ink-and-oil paintings, Kutner (Z Is For Zombie) and Hillenbrand (Kiss the Cow) serve as guides on a boisterous barnyard tour that shines the spotlight on animal sounds and behaviors. From sunup when “Kid wakes up!” to sundown when it’s “Shh!” Quiet Town,” a young goat romps around the farm to visit his friends—and stir up some fun. Hillenbrand depicts the kid in free-rein-fun mode, providing a visual story that playfully extends Kutner’s somewhat basic concepts. While “Crows peck straw—/ Caw. Caw. Caw./ Down on the farm,/ Down on the farm,” the kid can be seen tugging on an old boot of the scarecrow, an item he carries with him to each new scene and that eventually becomes stuck on his head. Throughout, Hillenbrand simplifies his typical style to match Kutner’s tone…Very young children will surely enjoy the kid’s antics, as well as the energetic encouragement to quack, “nay” and gobble along with the animals here. 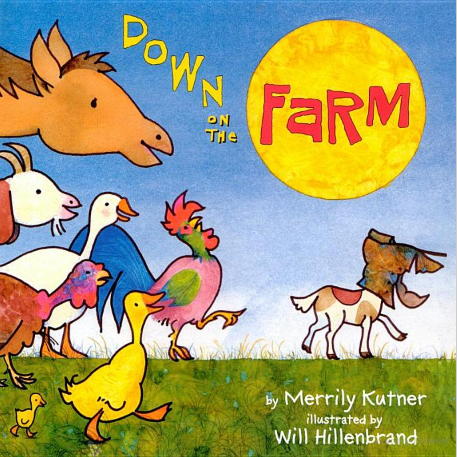 Illustrations for Down on the Farm by Will Hillenbrand, 2004, 2009.